Focus on the Family, the behemoth Religious Right organization founded by James Dobson, has declared itself to be a church, thereby avoiding a requirement that it file public tax documents, according to IRS records and a document available on the organization’s website. 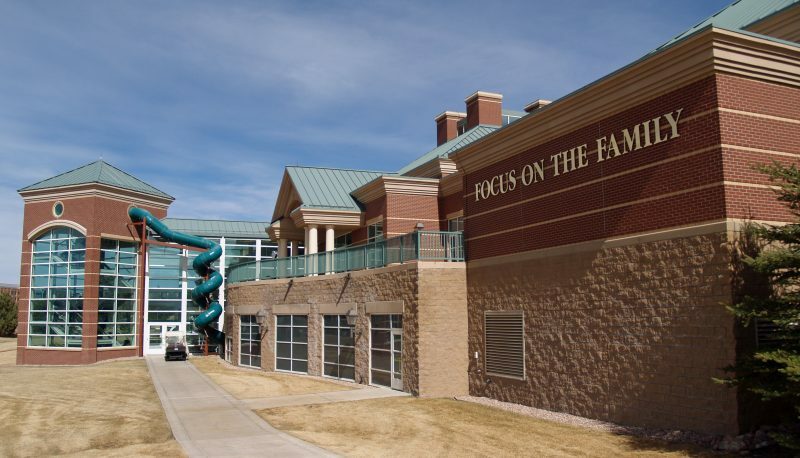 Focus on the Family has posted a tax return on its website that declares that it is a church, but has not filed the return with the government. The IRS’s master database of tax-exempt organizations, last updated on February 13, also indicates that Focus is listed as a church that is not required to file a 990. Focus on the Family declaring itself to be a church is puzzling. While the Colorado Springs-based organization has somewhat softened its image since it was led by the firebrand Dobson, it remains active in political debates and advocacy (even in a nominally nonpartisan way). 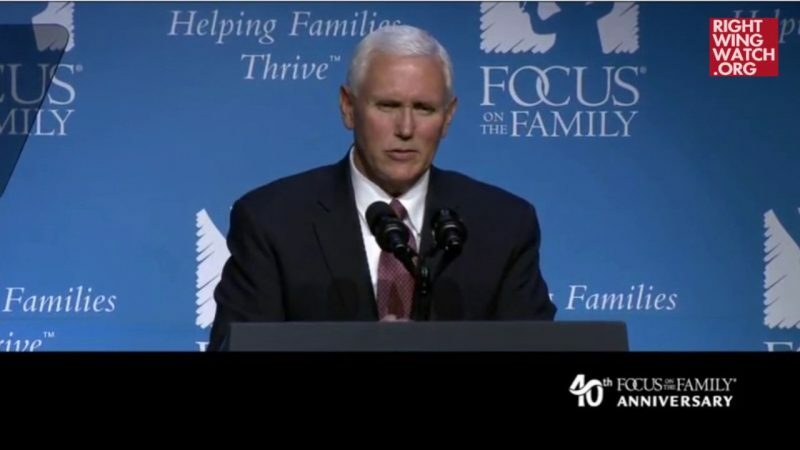 A “social issues” section on the group’s website currently features information on a supposed threat to bathroom safety posed by transgender people thanks to LGBTQ activists fighting in politics, churches and popular culture, and contains an update on “cultural issues in the courts.” In June, Focus invited Vice President Mike Pence to speak at an event celebrating its 40th anniversary, where he promised the group it had an “unwavering ally” in President Trump. Gail Harmon, an attorney who has advised nonprofits on tax law for more than 30 years, said that she had never before seen a nonprofit organization declare itself a church. “I just found it shocking,” she said. The IRS lists a number of factors that it considers in determining whether an organization is a church, including whether it has a “definite and distinct ecclesiastical government,” “established places of worship” and “regular religious services,” but notes that an organization “need not have all of the characteristics” listed in order to be considered a church. Samuel Brunson, a tax law expert at the Loyola University Chicago School of Law, said that it is difficult to create clear rules on what counts as a church for taxation purposes without running afoul of the First Amendment. “Because of the First Amendment, Congress and the IRS are hesitant to create bright-line rules for fear of creating unconstitutional rules, which means that everything is fairly murky in the area,” he said. Focus on the Family’s more explicitly political affiliate, the Family Policy Alliance, is still registered as a 501(c)(4) organization. The Family Research Council, the leading anti-LGBTQ and social conservative advocacy group, was part of Focus on the Family for a few years in the late 1980s and early 1990s, but became an independent organization in 1992, although Dobson remained on its board for some time. We have requested documents on the tax status change from Focus on the Family and from the IRS. Focus on the Family has not responded to our request for comment. Many Religious Right organizations have been advocating for the end of the Johnson Amendment, which prevents certain tax-exempt groups, including churches and religious organizations, from advocating for or against political candidates. Ending or revising that requirement could create a huge loophole for organizations that label themselves as churches or religious organizations to launder political contributions—taking and spending political money with no public disclosure while giving funders a “charitable” deduction. But given that Focus on the Family is still publicly sharing information about its finances, even if not through the IRS, it may have other considerations in mind. There has been considerable worry among Religious Right organizations, particularly when they feared the election of a Democratic president in 2016, that laws guaranteeing equal rights for LGBTQ people could threaten their nonprofit status if they discriminate in employment, facilities use, or in other ways. After the Obergefell marriage equality decision, a cottage industry sprung up of organizations giving legal advice to religious conservative groups on how to insulate themselves from nondiscrimination laws, including by developing doctrinal statements making clear their religious objections to LGBTQ rights. In another arena, fights over access to contraception have caused nonprofits and even some for-profit corporations to cite religious beliefs in order to avoid allowing their employees to access copay-free birth control through insurance. One group that has always been exempt from the Affordable Care Act’s contraception coverage requirement is churches and other houses of worship. While Focus on the Family appears to have only recently changed its status with the IRS, another prominent Religious Right group, Liberty Counsel, has quietly been operating as a “church auxiliary”—also not required to file a Form 990 with the IRS—for more than a decade. Back in 2012, Americans United for Separation of Church and State reported that since 2006, LC had been claiming to the IRS that it was a “church auxiliary” not required to file a Form 990. Later that year, LC appears to have started filing with the IRS again. But new documents unearthed by David Cary Hart of the Slowly Boiled Frog blog suggest that the Form 990s that Liberty Counsel filed for the 2011 through 2014 fiscal years were purely voluntary and that it has maintained its “church auxiliary” status throughout that time. Documents that Hart obtained from the IRS through a Freedom of Information Act request show that Liberty Counsel requested in 2006 that the IRS recognize it as an “integrated auxiliary” of Thomas Road Baptist Church, the Lynchburg, Virginia, megachurch founded by Jerry Falwell that launched Liberty University. According to a piece in Newsmax Magazine in 2014, soon after Mat Staver founded Liberty Counsel in 1989, the group represented Thomas Road Baptist in a case involving the amassing of land by faith-based groups. Staver went on to lead the establishment of Liberty’s law school, where he served as dean for many years while running Liberty Counsel. Liberty Counsel is based in Orlando, Florida, though it has collaborated with Liberty University on programs in Lynchburg. In April 2008, the IRS granted Liberty Counsel’s request to be recognized as a church auxiliary, backdating the decision to October 2006. According to the IRS’ master database of tax-exempt organizations, LC is still listed as a religious organization that is “not required to file” with the IRS. The IRS confirmed with us that an organization listed in the way that LC is would not have to file a Form 990. Brunson explained to us that the “integrated auxiliary” category that Liberty Counsel is claiming was added to the tax code to cover a few organizations affiliated with the Mormon church that no longer exist. While an “integrated auxiliary” does not have to file Form 990s with the IRS, it is not shielded from audits in the same way that a church is. Liberty Counsel’s more explicitly political affiliate, Liberty Counsel Action, is still required to file a financial disclosure form as a 501(c)(4) nonprofit. Liberty Counsel is the group that represented Kentucky clerk Kim Davis in her quest to deny marriage licenses to gay couples after the Supreme Court’s Obergefell decision and tried to save Roy Moore’s job as Alabama’s chief justice after he told lower court judges to ignore the U.S. Supreme Court’s marriage equality ruling. It also produces a daily radio program where the group’s founder Mat Staver and fellow right-wing activist Matt Barber have advocated for Russian-style anti-gay laws in the U.S. and warned that the Boy Scouts would become a “playground for pedophiles” if it allowed gay people to become scout leaders. Liberty Counsel has issued press releases claiming that the Trump administration can ignore a court order to allow undocumented teenagers to access abortion and crusading against a pro-LGBTQ teacher in a Florida school.